Finally. I did promise. I'll be honest here - these flowers are time consuming and if you want lots of them, you'll want to start several months ahead and work steadily. This is the method I used for most of our wedding flowers. (The spiral flowers were made using this tutorial that I've linked to before.) I was trying to figure out how to do the tutorial and realized that it's probably easiest just to send you straight to the photoset on Flickr. You can click through or watch as a slideshow, and I've included notes. It's easier to show than explain, with this. So click here and then you can come back if you need more notes. You can make the flowers look vastly different, just by tweaking a little. Change from squares to rectangles to make tall narrow flowers. Change the sizes to whatever you want. Adjust how much you trim off the edge, trim in different shapes. But this should give you a nice solid foundation. 1. Purchase your paper. I used these exact pads of watercolor paper (I bought the 18x24" size) and they worked well. I spent about $85 on paper, but didn't have enough time to use all of it. 3. Cut your paper. I cut into 3", 2" and 1" strips, using a cutting mat and a rotary cutter. Then I continued on, cutting into squares. The 3" and 2" squares were most easily done with the rotary cutter, but I preferred free handing the 1" squares as they're a bit fiddly. 8. Continue to add more petals. You'll want the petals to flare out more and more as you work your way along. Eventually, you'll end up with a nice full flower. I just laid down sheets of white cardstock, plopped a vase on them and then started gluing the paper flowers to the paper, making a carpet. There was no real rhyme or reason to this and it actually goes pretty quickly. You just want to work with a nice mix of sizes and create a full effect. When you're happy, remove the vase, trim the edges away so that you can't see them and then tuck the centerpiece in a box, ready for transport. This is actually the easiest (and most fun) part of the entire process. P.S. - If you're looking for more wedding (or party) tutorials, the streamer backdrop and painted tablecloths and hand dyed napkin tutorials are up on 100 Layer Cake! I was looking forward to this tutorial, I actually tried it when I saw one of your posts about the flowers, but it didn't really work. now I know where I went wrong. Thanks for sharing this! i may hit this with kraft paper for a holiday wreath this year. thanks so much for walking us through it! Your creativity (and patience) astounds me! I love these so much! xo. Beautiful and creative i love it ! Found your tutorials and wedding photos via 100 layer cake. LOVED them all and have been "pinning" away for ideas/inspiration. It was all just so beautiful! Love the blog! Oh my dear these are just absolutely lovely!!! I need to try this ASAP - too pretty! Can see how time-consuming these must be to make...but the results are so pretty! I know I'll have to try those over winter break, as I totally nerd out over paper crafts. Thank you for posting the tutorial! Stunning. Simply beautiful, and I can say that these are the nicest paper flowers I've seen in a loooong time. Thank you for sharing! Very beautiful and beautifully photographed. I was wondering if it would speed things up if after you cut the strips, you pull the strip over the edge of a table or counter to encourage the paper to curl. 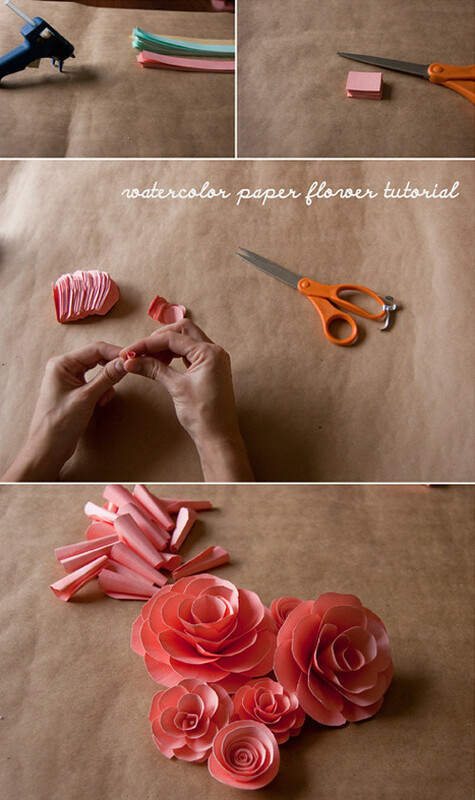 You can still stack the strips to cut them into squares, but the step of curling the petals would be easier. As well, pay attention to the direction of the grain of the paper when you cut the paper into strips, especially if it is a heavier paper. The grain should be across the width of the strip, not the length, inorder to make it easier to curl. Do you use the same size paper for the whole rose or do you increase the paper size as the rose gets larger? @ sophipingram - I used the same size paper for the entire rose. I think you could experiment with varying it as well and you'd probably get great results. It was just simpler for me to do it this way. Your flowers are gorgeous - how lovely! I've got these linked to my paper flowers post too today, well done! What an awesome tutorial, so detailed! Thanks for your generosity. 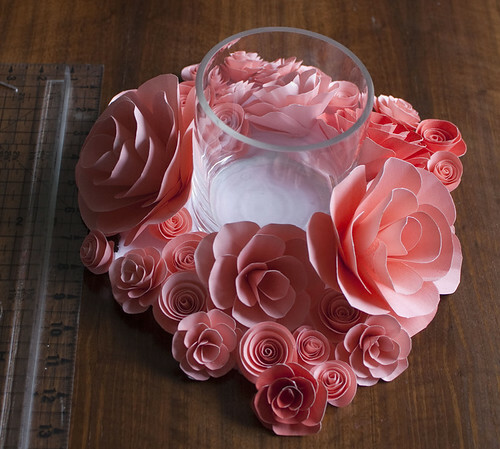 I'm thinking of making these instead of real flowers at my upcoming wedding, and I was wondering how much paper you used per flower? Also, do you think they would work with linen card stock? I honestly have no idea how to calculate how much paper per flower! I'm sorry - I did everything in a large batch. I think they would work just fine with linen card stock. I do recommend using something that is about 90lb paperweight, as I tried heavier and lighter and this seemed to work best. Thank you! I'll let you know how they turn out! Wonderful flowers and perfect tutorial Thanks ! Wow Community School would love to have you teach! I'll have to work at this so I can share with others! Amazing flowers.....! thnx 4 sharin! Amo flores de papel. Muito lindo! i'll b trying my "green" (paper) finger asap! Hi. I was wondering if you could show more picture instructions to see the flower " grow " to completion. It would be very helpful to see it from start to finish. Thank you so much. Hi, Susan - Did you already click through the entire Flickr set? I don't show the entire process, but there's much more of it than is shown here. Sorry I can't add more pictures! After this tutorial was over I was relieved to finally get rid of the leftover supplies! tres tres beau ou peut on avoir le tutoriel? Damn cute and simple. Will make ASAP! Hmmmm - I honestly don't remember which direction I cut, but it shouldn't make a difference. Both 18" and 24" are divisible by 1, 2, and 3, so either way you cut you shouldn't end up with scraps. Does that make sense? And yes, once you have the strips, whatever the length, you then cut them into squares. I made flowers of varying sizes, so I needed 1" squares, 2" squares and 3" squares. awesome ..nd so beautiful !! !